RIGHT: "The focus of Realtime Landscaping Architect is on residential landscaping, but many of our customers use it for commercial design as well." LEFT: When you add objects or plant symbols, for example, to the plan view, the corresponding objects also appear in a 3D view. LASN: How do you create photo-based designs? IS: Many designers pre-sell prospective clients using Architect's photo-imaging application. First, take a photo of your client's property. For larger jobs, you may need multiple photos, each focusing on a specific area to be landscaped. Next, import the photo into the photo-imaging application using the wizard. If needed, use the built-in cloning and other tools to remove existing plants, correct colors and make other changes. Then, add a new yard, plants, edging, and other proposed design changes. Experienced designers often do this onsite using their laptop. For smaller jobs, this may be all that's needed. For larger jobs, you can use the 2D/3D application for more comprehensive design proposals, landscape plans and planting detail. LASN: Can you create landscape plans with a hand-drawn look? IS: Yes, you can customize the plan view to match your design style. The software includes thousands of plant symbols, color washes, color pencil, markers and other materials you can use while designing your plan. You can use multiple themes in the same drawing. For example, you could use muted symbols for common plant material and brighter symbols for specimens. The drawing tools include freeform curves, so you get the benefits of a hand-drawn look along with the ability to easily make changes. LASN: Water features are becoming increasingly popular. Does the software support them? IS: Yes. You can design irrigation systems, custom swimming pools, spas, ponds, waterfalls, fountains and more. Wizards are provided for adding pre-built objects, or you can design your own from scratch. LEFT: To design a deck, for example, all you need do is draw the deck's outline. 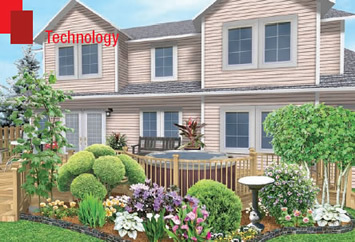 Everything else-joists, posts, deck surfacing, railings-is created automatically. If you decide to add stairs to the deck, the deck and railing are automatically rebuilt to accommodate the stairs. LASN: What client presentation tools are provided? IS: There are several. You can print the plan view to any Windows-compatible ink-jet or laser printer. You can create movies and show clients a virtual walkthrough of your proposals and design ideas. Using the high-resolution screen shot feature, you can email clients pictures of the plan and 3D views from multiple perspectives. During movies and walkthroughs of your 3D designs, water features ripple and flow realistically, birds fly through the air and you can even see fish swimming in the ponds. Clients often find this level of realism very impressive. Using the plant growth feature you can also show clients an estimation of what their landscape will look like after one to 20 years of growth. LASN: What plants and other symbols are included? IS: The software includes over [16,000] objects and materials, including [6,650] high-resolution plants and [3,000] accessories. You can expand the object library by importing your own custom plants, materials, 3D accessories and other items. You can create custom 3D objects using Google SketchUp and import them into Realtime Landscaping Architect. Google's 3D Warehouse is an amazing repository of [millions] of objects that you can downloaded for free. LASN: Does the software support varying terrain elevations? IS: Yes, you can design slopes, hills, raised flower beds, terraces and other features using the terrain sculpting tools. The tools work in real time and you can interactively adjust the terrain elevation at any location. Objects such as fencing, edging and retaining walls automatically conform to the underlying terrain. LASN: Is Architect Compatible with AutoCAD? IS: Not directly. Architect is much more focused than AutoCAD and similar CAD programs. For example, in AutoCAD a large number of steps are required to build a swimming pool. A hole must be cut in the terrain, the pool interior, coping, tile and other parts must be added manually. A special layer must be added for the water, and so forth. It is a time consuming, to say the least. With Architect, all of those steps are done automatically, so the file formats are inherently incompatible. However, you can add AutoCAD drawings to Architect's plan view using Object Linking and Embedding (OLE). For example, you could add a floor plan for use as a drawing template. LASN: Do you offer a free trial? IS: Yes, you can download the free trial of Realtime Landscaping Architect at www.IdeaSpectrum.com/trial.php. LASN: Where can someone get more information on Idea Spectrum? IS: More information about Idea Spectrum can be found at www.IdeaSpectrum.com. You can also call us at 1-866-894-4332, or e-mail sales@IdeaSpectrum.com.